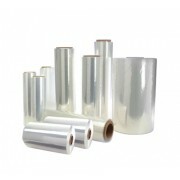 Polyolefin Shrink Film or POF Shrink Film is a strong and high clarity biaxial heat shrinkable film that has stable & balanced shrinkage and soft corner during packaging. POF Shrink Film Feature of tough, cold resistant and soft, it can protect your products efficiently and doesn't emit harmful gas during usage. It is an economical product which works easily on most shrink packaging machines.